Here I am again, trying to play baseball. For those who are new to my endeavors, here’s a quick recap. March 23, 2000 — While surfing the Internet, I discover the existence of “organized” women’s baseball in the US. While there’s no “major league” per se, there are several organizing bodies, including the AAU and the loose confederation of leagues that form the “feeder” system for Team USA for the annual Women’s World Series and such. I wrote in my journal that day: “Does every fan long to be in the game, somewhere deep in his or her heart? Or is it just me?” A dream is born. April 10, 2001 — I decide that sitting around dreaming is not enough. I filled out the registration form for tryouts on the newly rechristened NEWBL web site (formerly WNEBL) and went to a practice session. “I’ve now spent a total of four hours in the company of the New England Women’s Baseball League, and already I know twice as much about the mechanics of baseball as I did before. ” I wrote. “I jumped in with a woman named Robin and caught the first throw that came my way… but was having trouble getting the ball all the way to her.” She showed me the correct way to hold the ball and to throw over the top, using my wrist. Robin’s full name is Robin “Bama” Wallace, and she was just inducted into the Women’s Baseball Hall of Fame in 2003. July 15, 2001 — I could not actually commit to playing the NEWBL schedule because of my travel plans for the summer of 2001, but the women in the league thought it would be great if I went to team practices to try to pick up the needed skills so that I might try out for real the following year. Once the season started though, even practices were tough to make, and I didn’t have much chance to work on my throwing or fielding. I did got to most of the games I could though, and helped with scorekeeping and the like. One day I was getting ready to eat breakfast and then mosey down to the field in Lynn (half hour drive) in time for the first pitch, when I noticed my cell phone blinking: voice mail. It was a league organizer asking me to bring my cleats and fill in for an absent player so that the Boston Blitz could field nine and not forfeit! I did not get a hit, but I did hit to the right side to move a runner. As I wrote that day “I’m sorry to report that my one outfield chance came in the bottom of the second to last inning, with no one on, the leadoff batter hit a nice fly ball my direction. It looked like it was coming right to me. In fact, it looked like it was going to fall in front of me, so I ran in a few steps. But then, when it was about twenty feet above me, it was suddenly also four feet behind me.” Oops. Well, I never HAD been taught how to catch a fly ball. April 7, 2002 — Okay, tryouts for NEWBL for real this time. I had been jogging and throwing against a wall all winter (it was a mild winter with very little snow) and was somewhat perplexed at how my arm seemed weaker than the year before. I could only throw the ball about sixty feet. But I went to try out, nonetheless. On the second grounder I took on the hard indoor clay, I got a bad hop that hit me in the temple right on the edge of my eye socket. I had to sit out the rest of the tryout with an icepack on my face, and I had a shiner so black it looked like I was wearing shoe polish on my face for about three weeks. (Coincidentally, that night I went to my first SABR meeting.) About the time the bruise was clearing up, I got a brief email saying that I did not make the cut, and I thought my baseball dream ended there. August 6, 2002 — I finally go to see an orthopedist about my elbow, which is still hurting. He touches it once, I wince, and he explains it’s torn. Or, it was, and now it’s a mass of scar tissue that needs ultrasound and rehab exercises. October 10, 2002 — I start physical therapy. The Ultrasound feels really weird and almost turns my stomach. The therapist also manipulates the injury to break up the adhesions. Ouch, ouch, ouch. But I start with exercises. Four weeks later I am pain free and am actually developing muscle tone again. I join an indoor winter softball league and find out I can’t hit a slow pitch softball. But it’s fun, even if it’s not baseball. 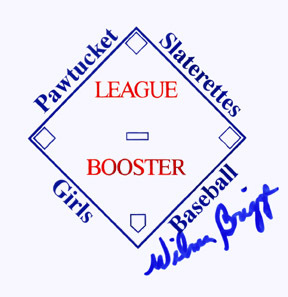 February 21, 2003 — I get email from a friend of a friend of a friend, Justine Siegel, who is an organizer of the WBL, telling me that if I want to play ball, I should try the Pawtucket Slaterettes in Rhode Island. I drive down to the Boys and Girls Clubs on a sign up day, and then have lunch with Deb Bettencourt, the player rep. They’ll have tryouts basically just to see what positions to slot people into, but anyone who wants to play, can. Sign me up! Even if it is a 90 minute drive for me. So that brings us up to the present. It looks like I’ll have a baseball diary to keep in 2003 after all. “Santa Claus” gave me a gift certificate worth an hour of coaching at Strike One and I had my first of two lessons tonight with Cheryl Milligan, who, as it happens, I know from NEWBL. Cheryl is a terrific coach who really knows her stuff. “So what do you want to work on?” she asked me. “Everything,” I answered. So we started with throwing. She took me all the way back to some basic drills we had done back in 2001 when I was hanging around the league, to help me use my wrist to put more snap on the ball, more spin. By the end of about 20 minutes of throwing, we had to leave the batting cage and go upstairs to start airing it out. At first I kept short hopping the longer throws to her, but then I started to get it. I think we were throwing about 80 feet by the end, and I felt like we could have gone farther if we hadn’t run out of room. It’s all mechanics. This year, I can actually feel the wrist snap in a way I couldn’t when I had the torn tendon. The tendon has been acting up a little recently–I tweaked it while shoveling snow this winter–but it feels BETTER when I throw, or at least it did tonight. I am going to keep up the Thera-band exercises I have, though, to keep strengthening the arm. Cheryl also hit me some ground balls, teaching me how to get my hands in position, to get the glove down at the right angle. And then she taught me how to scoop the short hop! It really is a “scoop” motion with the glove! I’ve seen firstbasemen do it a million times but I never would have figured out the motion on my own. I want to practice that more–it’s hard and I love anything hard if I think I can eventually master it. I suppose that’s my opinion of baseball as a whole. It was raining when I left Boston, but it was clear but chilly in Pawtucket when I arrived at Slater Park, where the Slaterettes womens teams play. Deb had scheduled practice from 6-8pm, but we actually only went until about seven, because it was getting dark! There are no lights at the field. We took ground balls, mostly. I went to second, where I feel the most comfortable, and I’m pleased to say I CAN make the throw from second to first! When the city of Pawtucket built this field for the Slaterettes, they made a mistake and the basepaths are slightly shorter than the regulation 90 feet. So maybe it was 80 or 85 feet. Many of my throws are still short, or air mailed–I need to develop that accuracy. But at least I know it is possible for me to get the ball there. For what its worth, I seem to be throwing about as well/poorly as most of the other women there tonight. No Amazons there this time around. And we had fun, joking around with each other. I did make some nice plays, and I took some double play relays at second. I have no idea what to do with my feet on that–I better ask Cheryl. I also missed a lot of balls I should have had. So no Gold Glove yet. But my confidence is building. How interesting. I just got email from the NEWBL organizers. The league is going through some very very exciting changes–they are being sponsored this year by the new independent league men’s team in Lynn, the North Shore Spirit. The Spirit spent $3 million to renovate Fraser Field for their season, and this will be the field NEWBL will play on, too. They are going to start from scratch and try to field four new teams under league management by the Spirit ownership. The Spirit will not only pay for all expenses, but also provide training facilities and also field a tournament team for the AAU women’s baseball championships. Wow. This really is the “big leagues” for women’s baseball. I emailed back and told them I know I don’t even approach their necessary skill level, but if their trying to recruit 64 players this late into the season, if they have trouble finding enough people, basically I’ll try out if it will help them get going. Emily Christie, a pitcher in the league who I have played catch with, wrote back saying “yes please do try out” and assigning me a tryout number. They gave me number one. Slaterettes “tryouts” were today, i.e. coaches evaluated players in a general way prior to the draft. The draft was going to be on Wednesday, but a newspaper article about the league just appeared, and a bunch more prospective players came out of the woodwork as a result. So there will probably be one more tryout day in the next two weeks, and then the coaches will get together and divvy us up. The weakest part of my game right now is still my throwing. With the Slaterettes it is not glaring because there are a lot of weak arms, it would appear. Whoever plays first base is going to be taking a lot of throws on hops. What we did today was this: there were about twenty of us in all, and they numbered us. The first four put on batting helmets while everyone else went out into the field to shag. They turned on the generator and the pitching machine, and we took turns hitting. After you hit, you went into the field and the next person came in. I was number four. 1) Strength: when playing catch, if I can only go to 80 feet when I am really airing it out, I still don’t have the arm strength I want in general 2) Summoning strength: but then sometimes I’ve picked up the ball and only have 50 or 60 feet to throw, and I still airmail it or short hop it because it feels like I can’t summon the arm strength that I DO have on the spur of the moment–I get the ball into my glove, turn to throw, and the ball just dies… but maybe I am rushing something mechanically in this process? or maybe it’s partly that my arm gets stiff while standing around out there? 3) Mental: I still can’t quite visualize what it will look like from my perspective when I throw a pea to first. I just sat and tried it and it is getting clearer, but in that spur of the moment when I’ve charged in for a ball, all my visualization goes out the window. There’s a connection I’m not making here, yet. I need to get the ball in part one and in part two flip the switch for the throw, make it flow with the right mechanics. So, throwing, throwing, throwing. I had to laugh at Bob Cluck’s exercise program in his book on “how to throw farther in just 30 days.” On day one of the program he says to throw the ball 120 feet, 20 times. From the look of the women and teenagers trying out for the Slaterettes, I’d say maybe three of the twenty who were there today might have been able to do this. No actually, maybe no one there really could. I guess I’ll just stick to throwing with Cheryl and throwing against a wall whenever I can. I know what I have to do. Now it’s just mind over matter. Put my work in and see how far I can go. This was written by Cecilia Tan. Posted on Wednesday, May 7, 2003, at 4:19 am. Filed under On Playing the Game, Women In Baseball. Tagged pawtucket slaterettes, women playing baseball, women's baseball. Bookmark the permalink. Follow comments here with the RSS feed. Post a comment or leave a trackback.